low calories dips collection. low calorie sauces. Dips are an ever-popular evening for Snacks and Starters and at parties too, they are loved by all, young and old alike. Sadly most of the unhealthy fats come from dips and sauces as they are loaded with oodles of oil. You can make your dips low calorie and healthy by replacing oil in the oil based dips by curd or vegetable puree. Make your boring snacks exciting with the low calorie dips recipes from our site. Prepare dips using vegetables and make it high in nutritive value. Add a Lebanese touch to your snacks with this Tzatziki Dip which is prepared using hung curd. Or try this flavourful recipe of Cauliflower and Spinach Dip with your choice of vegetable sticks or any healthy low calorie snack. This Pumpkin Dip is sure to be loved by all coz of its rich mouth-feel and amazing colour and the taste is just out of this world. Harissa Sauce an innovative spicy sauce which is originally an African recipe, goes well with a variety of snacks like Mint and Masoor Tikki and Lehsuni Matki Palak Tikki. Salsa goes well in salads and also as an accompaniment for snacks and starters. This unique recipe for Uncooked Salsa is an easy and tastier version of the traditional recipe, it is jain friendly with juicy tomatoes and crunchy capsicum. Did you know that green tomato can also be used for making sauces? Green Tomato Salsa is a wonderful low calorie recipe that can be enjoyed with healthy nachos, wraps and rolls. The green tomato not only adds a unique green colour but also kindles your taste-buds. 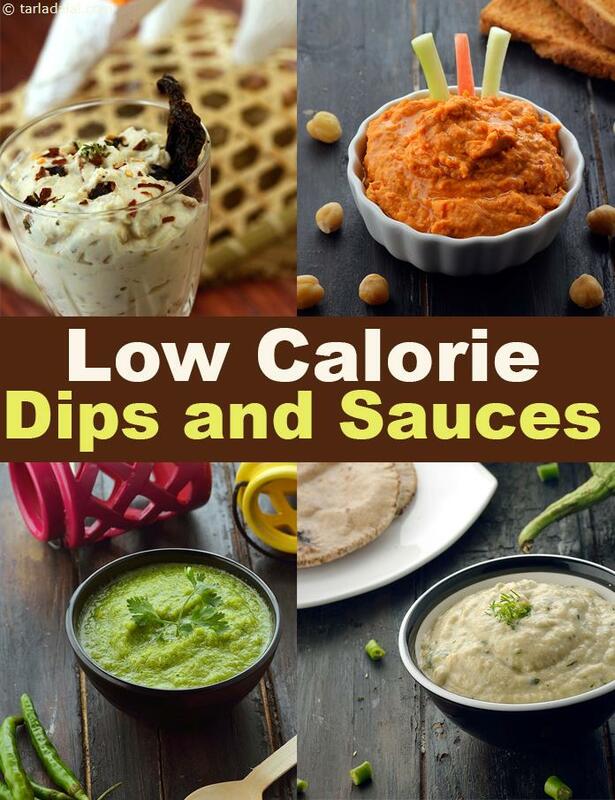 Enjoy a variety of Low Calorie Dips & Low Cal Sauces Recipes and other low cal articles from the options below.